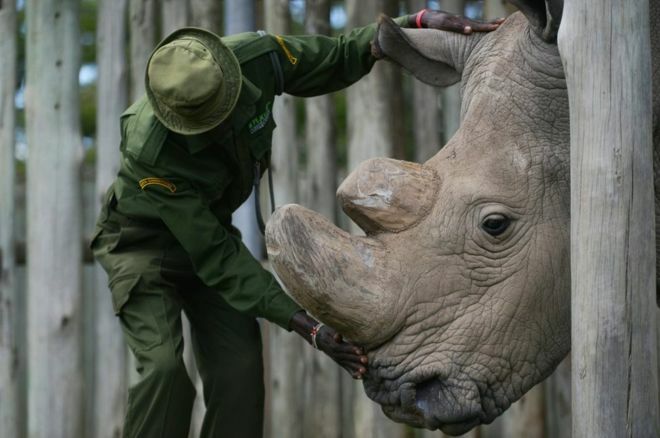 Sudan, The world’s last male northern white rhino, died on Monday after “age-related complications,” Kenyan authorities said on Tuesday. According to Old Pejeta Conservancy in Kenya, the 45-year-old rhino was euthanized on Monday after his condition “worsened significantly” and he was no longer able to stand. The 45-year-old muscles and bones had degenerated and his skin had extensive wounds, with a deep infection on his back right leg, researchers said. Sudan was one of the last of his kind. He had previously lived at the Dver Kralove Zoo in the Czech Republic before being transported to Ol Pejeta Conservancy in Kenya, where he was monitored 24/7 by armed guards. The northern white rhinoceros subspecies was once thought to have stretched from Chad to the Democratic Republic of the Congo, but their numbers have declined. A population of more than 2,000 in 1960 shrank down to just 15 in 1984, and there is only a tentative two alive today after Sudan’s death. Rhinos have a life expectancy of 40 to 50 years. Ol Pejeta Conservancy said that they had collected Sudan’s genetic material on Monday that could be used in future to attempt reproduction of northern white rhinos. Posted by Steven Addamah on March 20, 2018. Filed under Lifestyle. You can follow any responses to this entry through the RSS 2.0. Both comments and pings are currently closed.